IEC 60364-8-1:2019(E) provides additional requirements, measures and recommendations for the design, erection and verification of all types of low-voltage electrical installation including local production and storage of energy for optimizing the overall efficient use of electricity. It introduces requirements and recommendations for the design of an electrical installation within the framework of an energy efficiency management approach in order to get the best permanent functionally equivalent service for the lowest electrical energy consumption and the most acceptable energy availability and economic balance. These requirements and recommendations apply, within the scope of the IEC 60364 series, for new installations and modification of existing installations. This standard is applicable to the electrical installation of a building or system and does not apply to products. The energy efficiency of these products and their operational requirements are covered by the relevant product standards. This standard does not specifically address building automation systems. 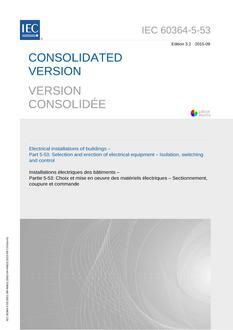 This group energy efficiency publication is primarily intended to be used as an energy efficiency standard for the low voltage electrical installations mentioned in Clause 1, but is also intended to be used by technical committees in the preparation of standards, in accordance with the principles laid down in IEC Guide 119 and IEC Guide 118.